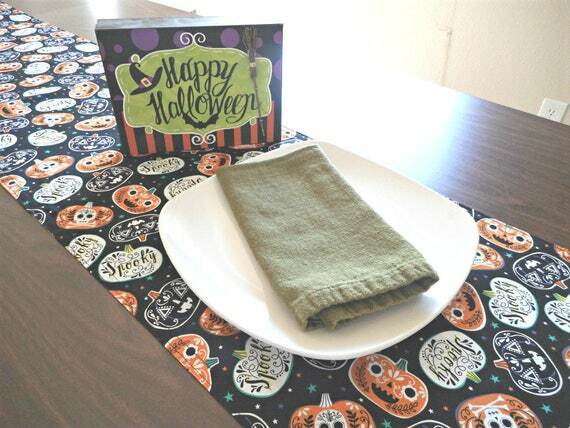 This cotton table runner is lined with polyester fleece interfacing to give them a slight firmness and stability. Think out of the box and use it in other areas beside your table. A spooky trio of little boo’s coming to your Halloween celebration. Prim table runner is hand painted on high quality muslin, stained with coffee and vanilla then baked lightly in the oven to give it an aged appearance. Sewn together with edges left to fray. Measures 40 inches long by 12 inches wide. Perfect for decorating your holiday table but don’t eat on it as you can only spot clean it. 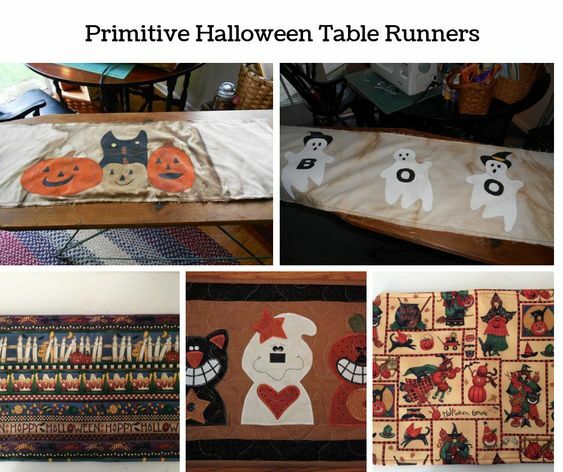 This is a wonderfully fun prim Halloween table runner just in time for the holiday. The cute trio of pumpkins sit in front of a spooky little kitty. Hand painted on high quality muslin. Stained with coffee and vanilla and lightly dried in the oven to give it an aged appearance. Sewn together with the edges left raw. Runner measures 34 inches long by 11 inches wide. 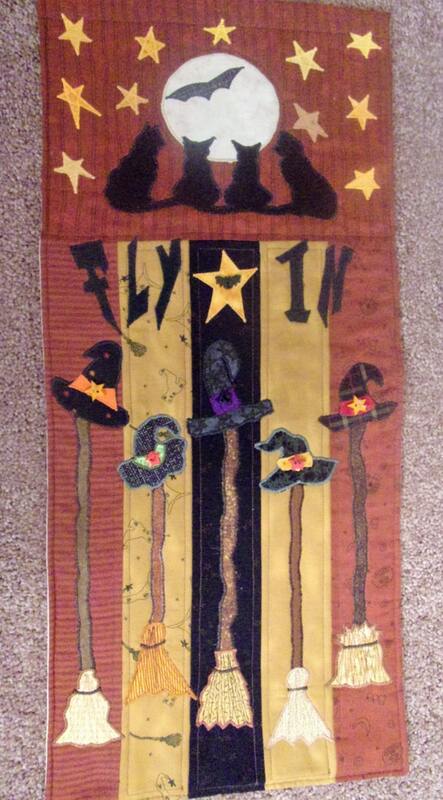 Primitive Whimsical HALLOWEEN Witch “FLY IN” Door Greeter Flag, wall hanging, or table runner. Flag is made from strips of prim Halloween themed cotton fabrics with hand-cut & hand-pieced appliqued brooms, witch hats, black cats, moon & stars, embellished with prim machine satin stitching. It has cotton batting on the inside and has a plain creamy onasburg cotton backing. Flag is seamed at the top. It hangs on a small dowel rod with a piece of twine as the hanger. It measures approximately 26 1/4″ long x 12″ wide (give or take a smidge!). 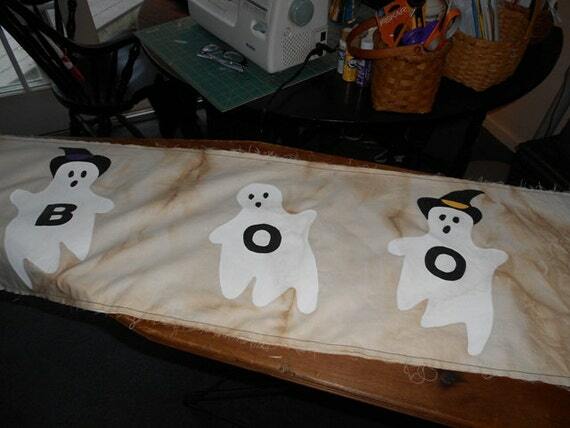 Primitive Whimsical HALLOWEEN “EEK” Ghosts/Bats/Pumpkin/Spooky Trees/Spooky Fence Door Greeter Flag, wall hanging, or table runner. 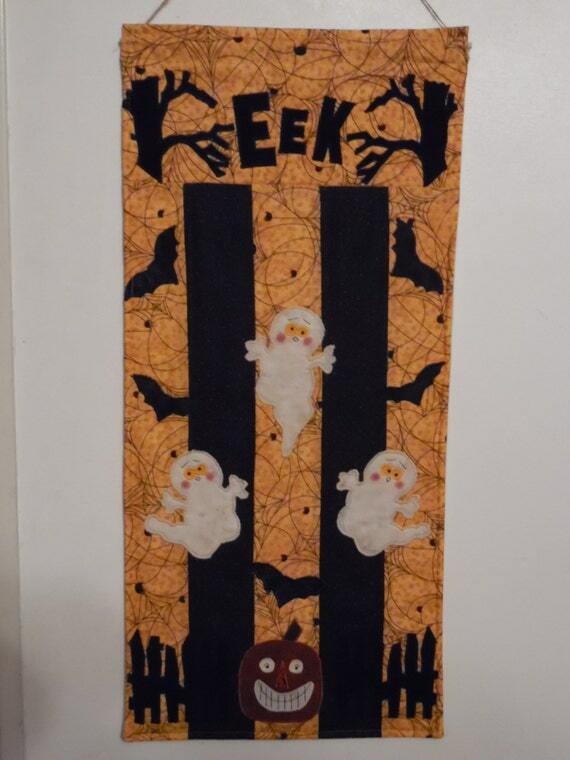 Flag is made from strips of prim Halloween & spider web themed cotton fabrics with hand-cut & hand-pieced appliqued ghosts, bats, pumpkin, trees, & fences, embellished with prim handstitching and machine satin stitching. It has cotton batting on the inside and has a plain creamy muslin backing. Flag is seamed at the top & hangs on a small dowel rod with a piece of twine as the hanger. 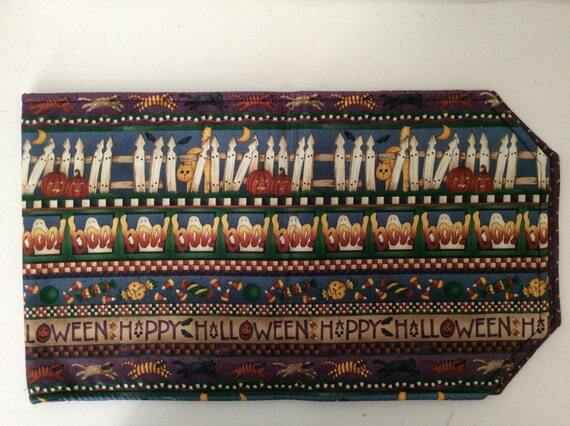 It measures approximately 26″ long x 11″ wide (give or take a smidge!). 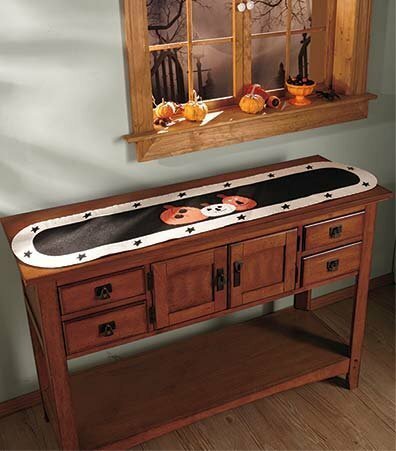 So fun for your Halloween table! 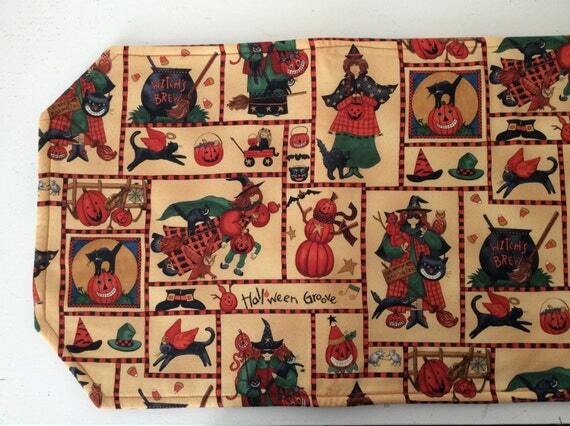 The reversible runner has a pattern of pumpkins with skull and crossbones and Spooky in orange, lime green, white and stars in green, purple and orange on a black background. The same pattern in on both sides. It is the perfect holiday accent for any table, buffet, sideboard, dresser, entryway table, anywhere! 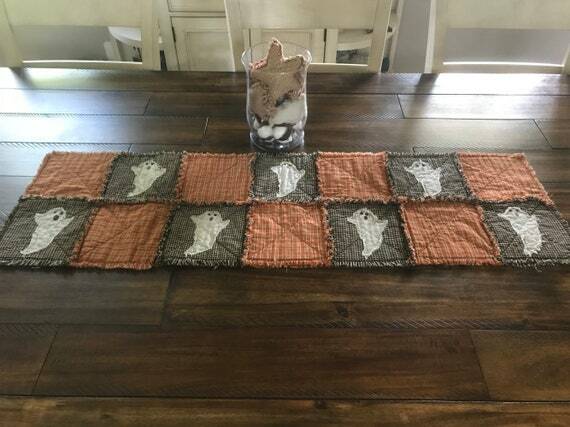 I made this table mat/runner with black/tan and orange/tan/black plaid homespun fabrics and attached tan ghosts giving it a wonderful Prim Look. Could be used for many purposes. I used Warm and Natural batting for the center sandwiched between the fabrics. Each square is “X” quilted. I clipped edges and washed once to start the ragging effect. Would look great in any home! Flower arrangement not included. 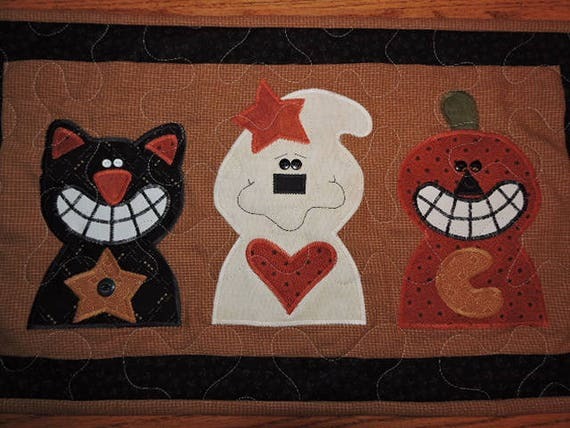 This Listing is for a Primitive Runner featuring a Black Cat with a Huge Smile…and a Star on his Chest, a Ghost with a Star on his Head and a Heart on his Tummy, and a Pumpkin with a Moon on his Chest. The Background is a Tiny Gold Homespun Checked Fabric. The Binding is Black with a Hint of a Gold Design in it. The Same Black Fabric was used on the Back Side. Binding is more of the Gold Checked Fabric. 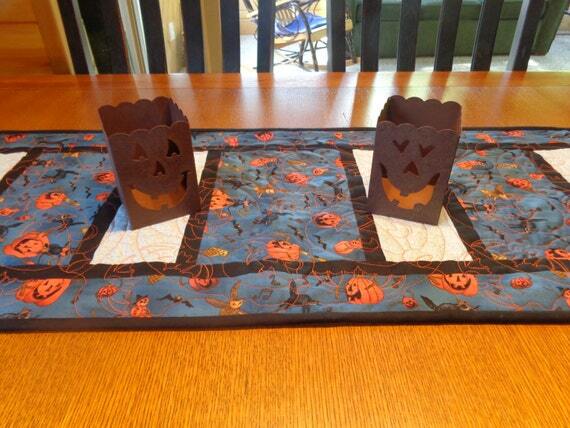 This simply spooky Halloween pumpkin quilted table runner measures a generous 15-1/2″ x 41-1/2″. 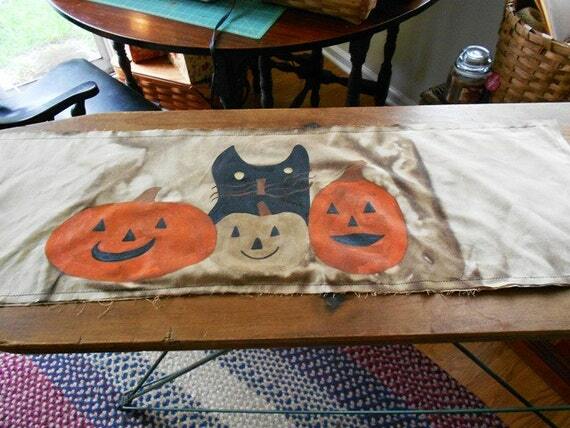 The focus fabric of the table runner is blue with pumpkins, bats, owls, and black cats with a light blue fabric accent bordered by black fabric. This will be spooktacularly beautiful as the centerpiece of your Halloween table setting, or a great hostess gift for the Halloween party where you plan on winning the costume contest! 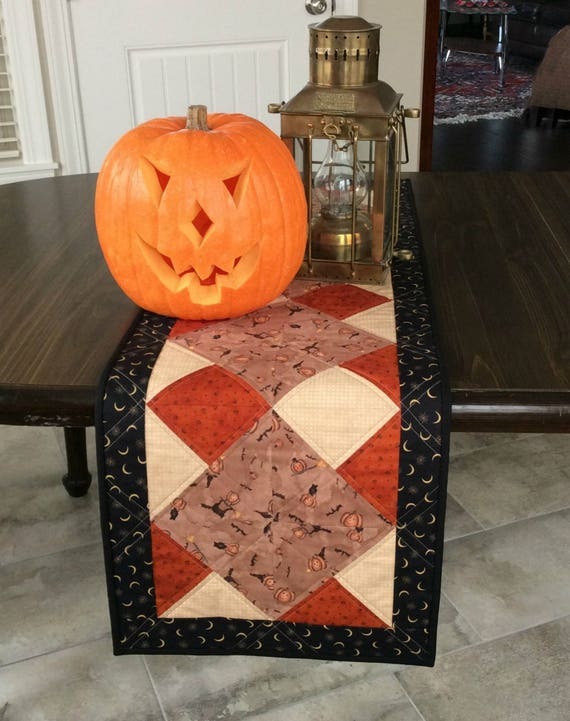 Custom quilting is done all over using a simple pumpkin and bat design in an orange color thread. We’ve chosen simple, earthy colors for this unique, handmade quilted table runner. Using 100% cotton quilting fabrics, we’ve pieced four center blocks with a checkerboard pumpkin/beige background and surrounded that with a midnight black frame. We’ve then layered this pieced top with cotton batting, backed it with a beige cotton print and quilted the assembly with cotton caramel-colored thread. To finish, we’ve used solid black double fold binding, machine stitched both front and back, for a wonderfully durable result. Get the Latest Halloween Sales & Promotions!